Does drag require performance or is Instagram enough? There’s no question that social media platforms like Instagram are changing drag: If a queen can adorn herself beautifully and snap a breathtaking photo, she can win fame without even leaving the house. But is the rising popularity of social media queens—who often emphasize garments and makeup in their work—causing trouble for the larger drag community? On one level, social media has created a new point of entry to the global drag scene, opening doors for a broad spectrum of talented visual artists who might otherwise be excluded—queens isolated in small towns, barred from clubs because of their age, or too shy or unwilling to navigate the jungle of nightlife. But for some, the growing presence of Instagram queens seems to be skewing public expectations for drag toward looks and fashion, and away from rich traditions of performance (including lip-synching, stand-up comedy, and dance), activism, community building, and so on. And in an industry where low-pay and high-expenses renders money rarely the object, any threat to long-held tradition is deeply felt. As a queen myself, I’ve defended both sides of the argument. But with a new season of RuPaul’s Drag Race: All Stars around the corner, the nightlife community is arguing more vehemently than ever about what makes a true queen. So I talked to some girls who made their names on stage, and some girls who made their careers online, searching for insight on drag’s new age of looks and likes. Aleera Night is a testament to the power of social media in the contemporary drag world, not because Instagram made her famous, but because it gave her the strength to launch a career. A gifted makeup artist based in Montreal, Canada, Ms. Night never had the guts go out in drag—that is, until she began creating online content. “I started doing looks on Instagram because I didn’t have a lot of confidence, and I wanted to do something that would make me proud of myself,” she told me. “So I started studying and getting inspired by other queens that I saw on Facebook, YouTube, or Instagram—and my looks got really good feedback.” In a little over a year, Ms. Night amassed a collection of stunning visual creations that expressed her obsession with fantasy films, and won her a supportive pool of fans and friends. As a performing queen myself, I know what Aventura is talking about. Sometimes people wander into drag bars expecting extravagant, polished looks, and if they don’t see something they like, they won’t wait around for a performance. They don’t understand that there’s much more to drag than image-making, and that sometimes an outfit has to be simple in order to survive the kicks and splits of a high energy show. Yes, sometimes, a great performing queen can look a little “crunchy” in person—but that doesn’t mean she’s not a great queen. And, in any case, even Instagram queens fall short of the standards they set. “I see a lot of makeup transformation artists who do these amazing transformations on Instagram, but you find out that it only works in a picture,” Aventura told me. “Because you see them out and it doesn’t work in real life. They just angled themselves in the picture so that it looked just right.” In short, the doctored images produced by social media queens sometimes push images of drag that are impractical if not impossible. The Chameleon of Drag 💅🏻🔥 Wanna know what I keep the same in Every look, @sugarpill Eyeshadows, can’t do a look with out them! But though drag has a rich history as an “in your face” performance art, as Aventura puts it, social media is clearly pushing the genre in new directions. 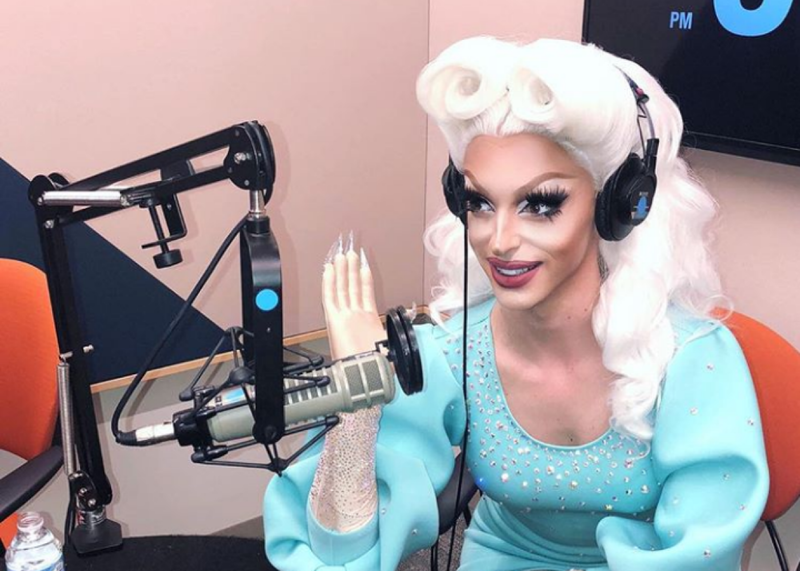 Ellis Atlantis, a queen and makeup artist with a broad reaching influence on Instagram, suggests that drag now requires simply being true to your “drag life.” “If you want to be an all-rounder then you’re going to have to perform or have some sort of act,” she says, “But I don’t think you have to perform and I don’t think a queen who doesn’t perform is any less of a drag queen. For Chicago-based Soju, who thrives both online and on the ground, surviving contemporary drag is all about balancing two challenges: real-world skill and visual, social media prowess. Queens who depend primarily on social media often meet with ugly practical problems. “Having a large amount of Instagram followers is not going to pay your bills,” Soju says, “Having followers can lead you to a booking, but when you get the gig, are you a good performer? Are you going to get asked back?” Every city and venue has its own expectations for nightlife queens—but no matter where you go, a look is rarely enough. In most New York City clubs, girls are expected to do stand-up, perform high energy lip-sync numbers and—for better or worse—dance. In Chicago, parties like Queen! at Smart Bar celebrate extravagant looks, but still require girls to mix and mingle skillfully, keeping guests entertained, tipsy, and coming back for more every week. I laughed with Soju about one of the ongoing beefs between our hometowns—Chicago girls hate when New York City queens step onto the stage without elegant nails on their fingertips. “For you New York girls it’s all about, ‘How can quickly can I change out of this outfit and get to my next gig? What’s going to be comfortable on the train?’” Soju laughs. “That’s what we think when we see you without nails.” I roll my eyes—it’s always a pain to figure out what audiences and fellow queens require when you perform in a new setting. But talking with Soju made me realize that queens are in a constant state of adjustment—trying to read the room in a new bar or a new town, trying to watch their sisters for new makeup trends. Now that social media queens have changed the drag landscape when it comes to standards of style, beauty, and engagement, we’ll just have to adjust yet again.